It’s been almost two months since the IPCPR Trade Show so, with the dust settling, it’s a good time to look back at some industry trends that were on display at the show. It’s my belief that quality is going up across the board in the cigar industry, and smoking plenty of samples only solidifies this opinoin. Obviously these are generalizations and no doubt there are exceptions, but it seems not only are the cigars being produced now better constructed than they were 5-10 years ago, they are better cigars that lack obvious flavor flaws. The result is good for consumers. Whether you buy discounted samplers online, or just pick up what looks interesting at your local cigar shop, odds are you’re going to end up with decent or good cigars. When finding a good cigar is easy, consumers expectations are raised. The result can be challenging for cigar companies. Here’s a thought experiment: Take a recent cigar release and imagine how it would have done if it was released five years earlier. Last year, CAO introduced the Concert series, a cigar with sales (I get the sense) that seem to be a little disappointing to CAO’s parent company, General Cigar. I’d suspect that if that same blend at the same price point had been introduced five years earlier (two years before CAO La Traviata) it would have been a smash hit. It is, in my opinion, a classic example of a cigar that would have stood out in 2007 or earlier, but now is just another good cigar in the crowd. It’s easy to discount cigar brands that don’t own a factory but instead contract someone else to make their cigars. For one thing, there’s an extra level, and that means an additional mark-up before the cigar reaches consumers. The brand owner has to buy cigars then mark them up before they are sold wholesale. Also, people assume that if the blend was so great why didn’t the factory just release and market it themselves? Those are valid points, but there’s also a niche that these small brands can fill. For large companies like General Cigar, Altadis, Davidoff, and Drew Estate, it doesn’t make a ton of economic sense to create a cigar that will sell only 40,000 cigars. But for a small cigar line owned by a single brand owner, that level of volume can be a nice little business, and they can afford to make a cigar that, while it may never be a huge seller, may find a small but dedicated fan base. Increasingly, one shop owner concern about bringing in a new cigar is that it will soon be available online for a significant discount. Traditionally, cigar makers have sought to deal with these concerns by protecting prices with a maximum discount (say 10% below MSRP) under which the cigar can’t be sold. But with the increasing number of consumers showrooming (visiting local stores while simultaneously price shopping online), that’s not always enough. The response from cigar makers is bifurcating their lines with some available and marketed to online retailers and others specifically brick and mortar only. 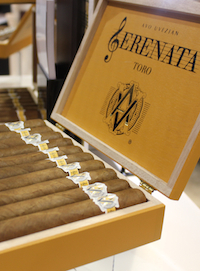 The AVO Serenata is an example of a new line strictly for brick and mortar retailers. This has been going on for a while, but it seems to be more prominent recently. With the advent of fire-cured tobacco, the line between traditional and flavored cigars is beginning to blur. Drew Estate’s Kentucky Fire Cured and Sam Leccia’s Black line are the most prominent, but others (Gran Habano) are introducing cigars that use fire-cured tobacco. It’s an interesting development where the line between traditional and flavored (Drew Estate calls them “infused”) is breaking down, because the difference isn’t unnatural chemicals being introduced to the cigar making process, but the traditional process being tweaked using old technology not normally used for handmade cigars. Look for this trend to continue. Great Points. I have said in several interviews lately, that I don't think there has been a better time to be a cigar consumer. If you you're going the fire-cured route, why not also take a look at putting the rare and unique perique tobacco leaf into a cigar? (You should already "have ton" on-hand since you're now blending pipe tobacco). You could put perique "on the map". You could call the line Frique by Drew Estate. 🙂 They should all be lancero sized with eagle feathers since the Native Americans invented the magical perique processes.